Todolwen: For A Short Time I Had A River ..
a few of you lovely bloggers told me that my river bed should have water in it once it is done and I would love for that to happen ... in a controlled way but that isn't what happened yesterday though. For a short time I had a river ... a overflowing river in my river bed! 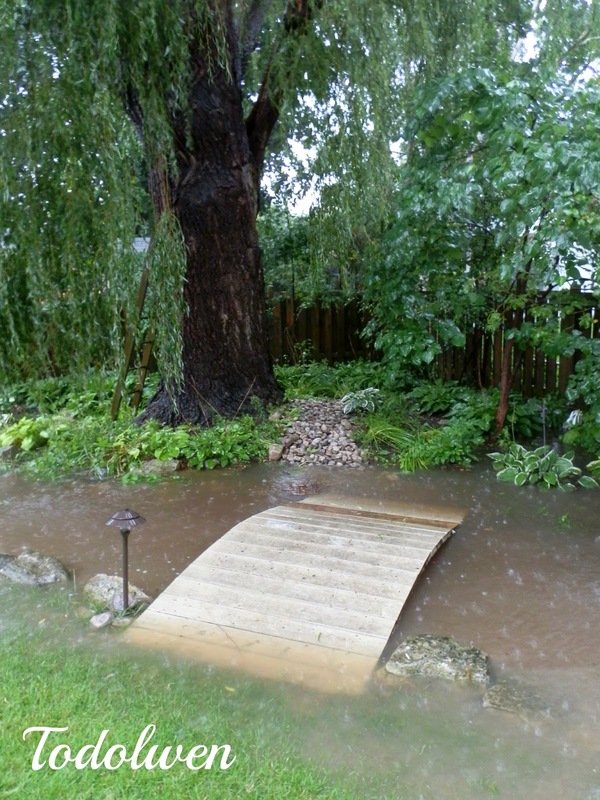 We had gotten so much rain and because our property is the lowest on our block we ended up with all the water from about 20 backyards or more in the bottom of our garden. The storm drain couldn't take as much in as, it was flowing and raining so much. Can you see the raindrops hitting the water?! It really intense for that short time but now everything is back to normal again. I am just glad our bridge didn't uproot and drift again because it's so heavy to lift and put back into place. That rain must have been fierce and fast - I can see the impact of the drops on the 'river'. I hope there was not damage to property. Oh Karen... so much water... hope everything is ok now. 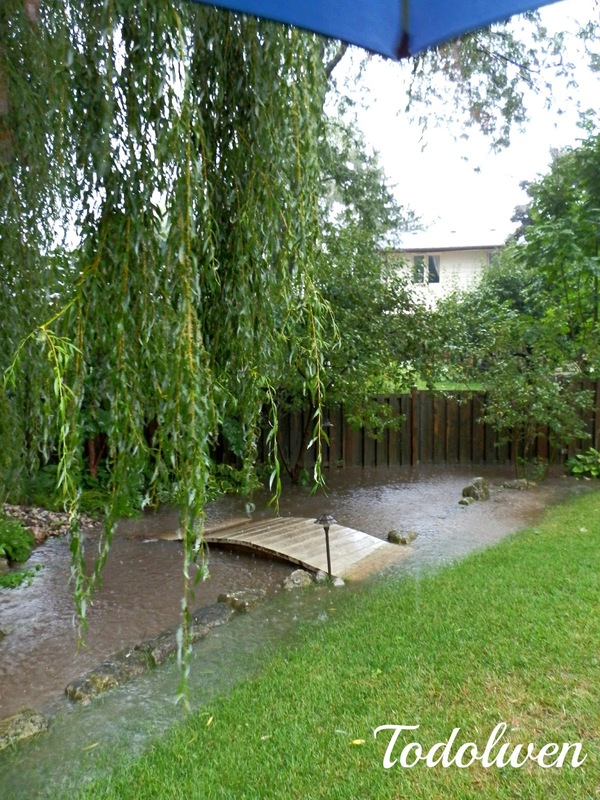 We have had two times so much rain this year and our little Innenhof was like a swimmingpool. That was some rain storm, and you did have quite the river there. Glad you bridge held on. Bet your glad you got the river bed all fixed up before this hit. Your river bed, meant to be decorative, is obviously going to serve a good purpose when there's heavy rain. Good thinking! 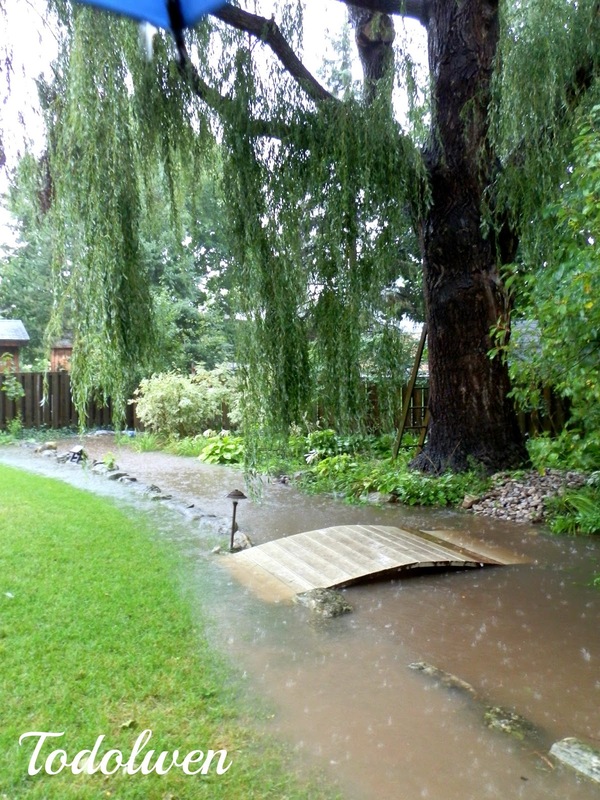 We had very heavy rains here in Michigan yesterday, but today it is starting to dry up again. Good to see your riverbed held up quite nicely through it all.